Lip lines sometimes appear early, but can often be corrected with a relatively simple nonsurgical procedure. This 57-year-old woman had vertical lip lines that she had first noticed when she was 30 years old. Over time, her lip lines worsened and the tissues elsewhere on her face also began to change in ways that bothered her. In her consultation she discussed her options for facial cosmetic surgery in St. Louis, as well as nonsurgical options, and decided to try a nonsurgical approach. 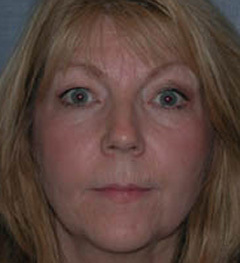 She received injections of BOTOX® Cosmetic in the deeper lines between her eyebrows, at her upper lip, and in the "crow's feet" at the corner of her eyes. Radiesse&red; was placed in the deep vertical lines of her upper lip, nasolabial folds and marionette lines. She also chose to receive Restylane® injections in her upper lip to give it a little more fullness, and began the Obagi® Skin Care system to help her skin retain a healthy smoothness. Some time after her procedure, we see a much smoother facial contour and a less puckered look to the mouth. Her lips also have a better curve, and her cheeks appear higher, fuller, and more youthful. Overall, the patient's skin looks less worn and more youthful. The patient was very happy with her experience with BOTOX in St. Louis.